A truly great adaptation of the classic vampire novel. Dracula is the story of the European vampire who comes to England to find fresh victims … And stumbles across a young woman who reminds him of his long-lost love. This is actually based on the Broadway play, and not directly on the original novel by Bram Stoker. Mina Seward: Why, Count Dracula! Count Dracula: There are far worse things awaiting man than death. Bela Lugosi‘s (The Black Cat) performance as the undead Count Dracula is absolutely wonderful and justly caused him to leap into stardom. He portrays the undead creature as virtually a wild creature, hidden under a faint veneer of a cultured gentleman. But as the quote above proves, there remains a small bit of the nobleman’s soul left in the undead corpse. That fragment remembers life, and despises his undead existence. But he is compelled to continue it all the same. Dwight Frye (Frankenstein) also does an incredible job as Renfield, the unfortunate who goes to Transylvania to complete the sale of Carfax Abbey in London to Dracula — and who becomes Dracula’s unfortunate thrall, and slowly descends into madness. His performance as a madman is riveting and very believable — and especially at his end, heart-rending. 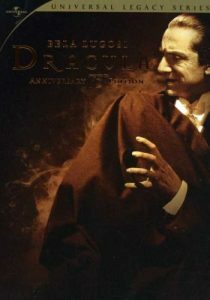 Edward Van Sloan (Dracula’s Daughter) does a phenomenal job as Professor Van Helsing, He does an excellent job of portraying Dracula’s opposite. Intelligent, educated, and strong-willed. Which the audience visually sees during a “duel of wills” roughly midway through the movie. Van Helsing is the protagonist of the movie, even more so than John Harker.